The Ikeja Electric Plc (IE), has carried out an oral hygiene intervention campaign across five primary schools within its franchise area where the pupils were taught the fundamentals of dental care as part of their cooperate social responsibility (CSR). The campaign, conducted was in conjunction with Unilever Nigeria Plc and health maintenance agency, Hygeia HMO, focused on promoting oral hygiene among primary school pupils, with a focus on the importance of brushing teeth twice daily, in a three-minute cycle, to help prevent tooth decay. Schools visited by the Oral Care campaign team include Ipaja Community Primary School, Ipaja; Owoseni Primary School, Oshodi; Coker Memorial Primary School, Ifako Ijaiye; Adiyan Primary School, Abule Egba, as well as the Local Primary School, Ipakodo, Ikorodu where physically challenged children also participated in the exercise. 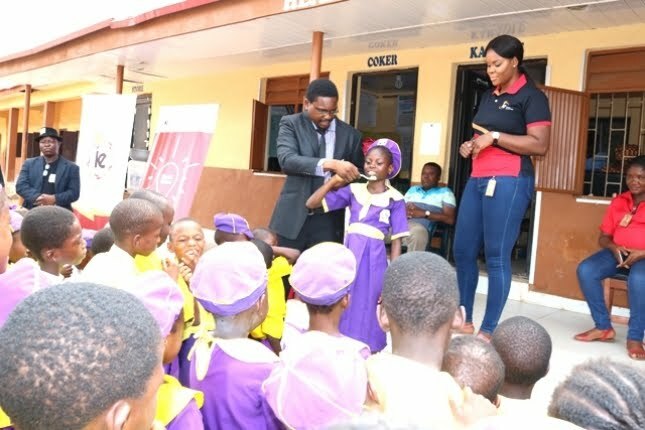 The Head of Corporate Communications, Ikeja Electric, Felix Ofulue noted that the CSR programme is aimed at ensuring improved well-being and good health for primary school children, through proper oral hygiene, in order to bring out the best in them. A pack containing toothpaste, toothbrush and oral health manual was handed over to each pupil after brief education and demonstration by Dr Abolade Majekodunmi of Hygeia on how to maintain oral hygiene. The pupils were encouraged to always brush every morning and night, using fluoridated toothpaste. The dentist urged them to stay away from sweet and sugary things in order to maintain oral hygiene, while they were cautioned to avoid eating high sugar based confectioneries and drinks and also encouraged to visit the dentist at least once every six months. In his remarks, Comrade Abiodun Coker, representing Ayobo-Ipaja Community Development Council (CDC), commended Ikeja Electric for organising such a programme, explaining that grassroots health initiatives such as this are always welcome to the community. He urged other companies to emulate the good gesture by showing interest in the wellbeing of residents and citizens in their area of influence. Ikeja Electric has remained commitment to giving back to host communities through its Personal-Corporate Social Responsibility (P-CSR) quarterly activities that have seen the company clean up markets, provide eye care, purchase books for schools as well as providing important and lifesaving health tips to minors.